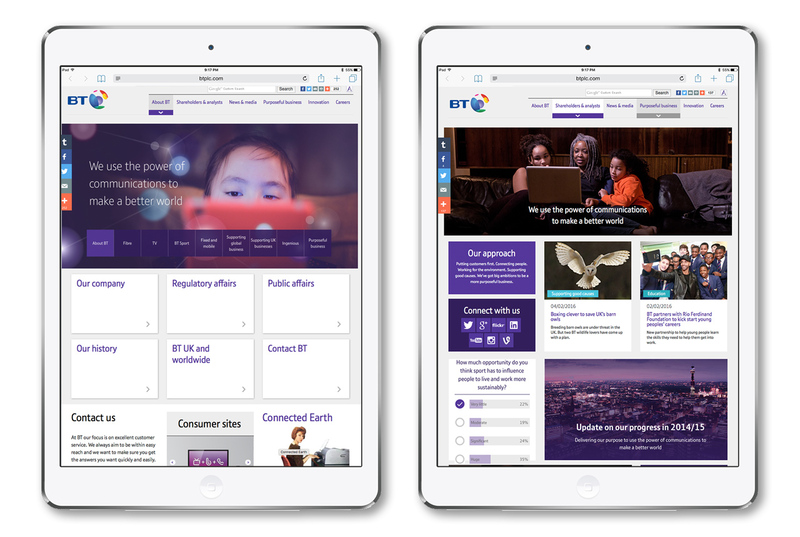 We've been involved in various iterations of BT's corporate website btplc.com for the last 10 years. Over the years we have brought it up to date to be at the vanguard of corporate websites. The challenge with btplc.com is coming up with a flexible design that work with its diverse audience - from shareholders to journalists, students to suppliers, and general members of the public who are interested in the company's progress. The user experience needs to serve up salient information particular to these various groups in the most efficient manner, but at the same time provide a seamless flow across the site. Perhaps one of the most important requirements is to communicate the BT Brand. This needs to be very succinct on the home page and permeate throughout. We have made sure that the brand experience is consistent and exemplary. The final design is responsive and works across all mobile devices.